Did you just realize your license is expiring and now need to make a DMV appointment fast? 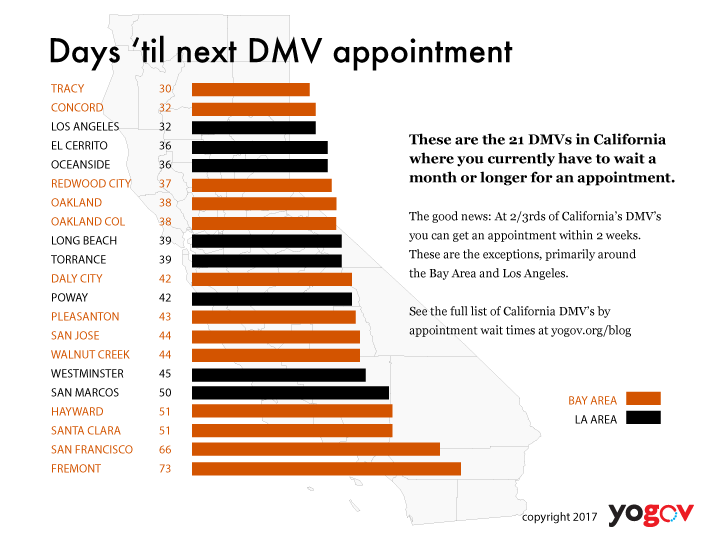 We charted out all the DMV locations in California so you can see how long you may need to wait for the next available appointment. Take a look and see if your local DMV is one of the 21 that has you waiting over 4 weeks. Last December we collected data on wait times at Department of Motor Vehicle (DMV) offices across California. This data showed us wait times when you just showed up without an appointment. As you might have expected, it did not look good. Wait times in popular urban locations were over 3 hours on average. Since then we've seen more appointments being made ahead of time. We've heard this anecdotally - from people waiting at the DMV and people using our service to book appointments. And we've also seen this based on the longer time needed for an appointment on the DMV website. Overall we think this is good news: Rather than waiting for 3 hours in line by showing up on a whim, you might be in and out in 30 minutes. However, here's the problem: Most people decide to go to the DMV when they need stuff done - renewals, registrations, permit tests. Most cannot wait weeks for their appointment. Here's Ryder from YoGov outside the Oakland Claremont DMV last month. The not-so-surprising thing: This was 7:45AM midweek and there were over 40 people in line before it even opened. And it was raining. It's a safe assumption to make that if these people could get access to a special "Appointment" line and jump to the front, they'd be pretty excited. Without further ado, here's what you should know before you make an appointment: The average wait times for appointments across California. In small towns or rural areas, wait times are pretty much non-existent for appointments. Here are the 44 locations where if you requested an appointment today, you could probably get an appointment tomorrow or the next day no problem. The bad news: You probably don't live anywhere near these places. Based on our data, we found that around 2/3rds of DMV locations you can get an appointment online within 2 weeks. So even if your license is expiring or you need to take a permit test, that time frame generally is okay for most people. 113 of the California DMV's we looked at showed appointments within 2 weeks. The flipside: 58 still have appointment 2 weeks or more, and these fairly directly coincide with the urban centers of the state. Live in Los Angeles, the Bay Area, or San Diego? You're probably going to be waiting for your appointment. Share on Facebook or on Twitter. We've seen wait times vary quite a bit within a region so don't just settle for the appointment thats 2 months away. Shop around at other locations or check back in a few days. Or book an appointment here and we'll automatically search for early appointments for you. It's not all or nothing: Wait in line for 3 hours or wait 2 months for an appointment. There may be a plum appointment waiting for you within the next week. While they're hard to come by, especially at these 21 locations, it's possible to land an early appointment.